Options are endless for those that now want to consume cannabis. Especially if you are in a recreational or medical state. You can eat it, rub it on, drink it, smoke it and you can even bathe in it. But one of the most popular methods of smoking is by oil cartridge. When I first came across an oil cart it was 2013 and I was mind blown. I had an OG PAX One for a while and that was some groundbreaking technology. I still had to use flower which meant odor and heavy maintenance. Oil cartridges change the game. Low maintenance, no smell, portable, discreet and some don’t even have buttons. 2018; am I right? But after the novelty wore off, I began to wonder - what was actually IN these cartridges. How accurate was the testing? With regulations changing almost weekly in California, how often did the formulas change? Through local blogs, Instagram accounts and sources like WeedMaps, consumers can begin to navigate the waters a little easier. Luckily, Dab Connection and @DatDude4510 had some fruitful answers. A grade of “FAIL” was given to brands that overtly failed for pesticides. They also noted weaker and stronger brands. You can find full test results on their page. Some notable FAILS that I was disappointed to see on the list include: Alpine Vapor, Heavy Hitters, Hitone, Moxie, OCPharms, STIIIZY and THClear. The ones in summary that turned up clean include: Bloom Farms, Brass Knuckles, Flight Farms, HoneyVape, Interstate 710, Jetty Extracts, Kurvana, Potter’s Cannabis Co., Select Oil and Rove. 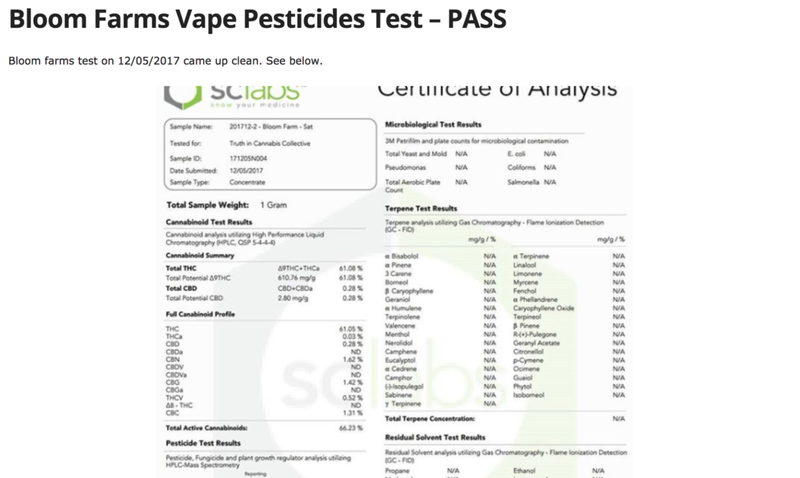 From the ones listed that passed for pesticides and solvents, I’ve tried Brass Knuckles, Bloom Farms, Select Oil and Rove. My tops have included Brass Knuckles, Rove and Bloom Farms. But are test results alone on a few select cartridges enough? Whenever I look to buy a new vape or try a new brand, I always check the WeedMaps reviews to see what other customers have said. Unfortunately, Brass Knuckles’ reviews were especially nasty. Their official response has been that there are too many counterfeit problems. They are rated a 3.6 out of 5.0 with 595 reviews. ROVE, another favorite of mine, has a 4.6 out of 5.0 with 692 reviews. What resources do you use to figure out if your product is legit or super not it? As the industry moves forward, we need to make sure the brands we use put the consumers first.